With core principles matched by concrete proposals, we can help to ensure the rules of trade better acknowledge the effect trade has on all people. 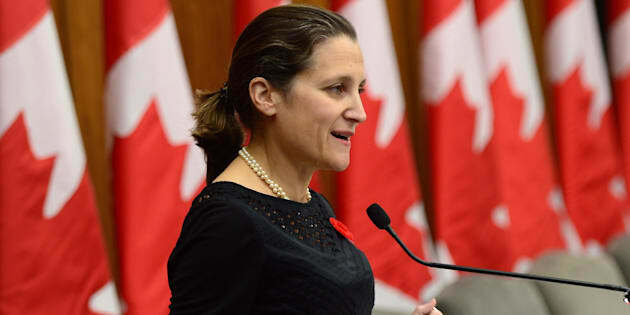 Chrystia Freeland, Minister of Foreign Affairs, makes an announcement on women, peace and security in Ottawa on Wednesday, Nov. 1, 2017. The fifth round of NAFTA renegotiations may be upon us, but with a revamped Trans-Pacific Partnership agreement now in the works, a final decision on trade talks with China impending, and various other trade negotiations advancing quickly, it is time for Canada's federal government to clearly define its so-called "Progressive Trade Agenda." Canadians need to know how a trade deal — like NAFTA, the TPP or others — can go beyond matters of corporate rights and market access and address the fundamental failings of globalization. Trade affects every part of our lives. Canadians know this. We export more than $500 billion each year in goods to the world. Including imports, trade represents roughly two-thirds of our annual GDP. International trade drives many of our jobs — jobs that our communities rely on. The sad truth, however, is that communities often suffer when companies take advantage of weak trade rules; those built into so-called "free trade agreements." Rules that help facilitate the export and import of goods, but also the outsourcing of our jobs and the undercutting of our work standards without reprisal. Just look at Ingersoll, where General Motors shifted production of its top-selling GMC Terrain to Mexico, even though sales of the Terrain in Mexico are virtually zero. GM was free to uproot more than 400 good-paying jobs in a community (with no requirement to justify the job losses, or commit to any future investment), and then simply sell back those vehicles to Canadians completely tariff-free — a situation made possible because of the North American Free Trade Agreement. 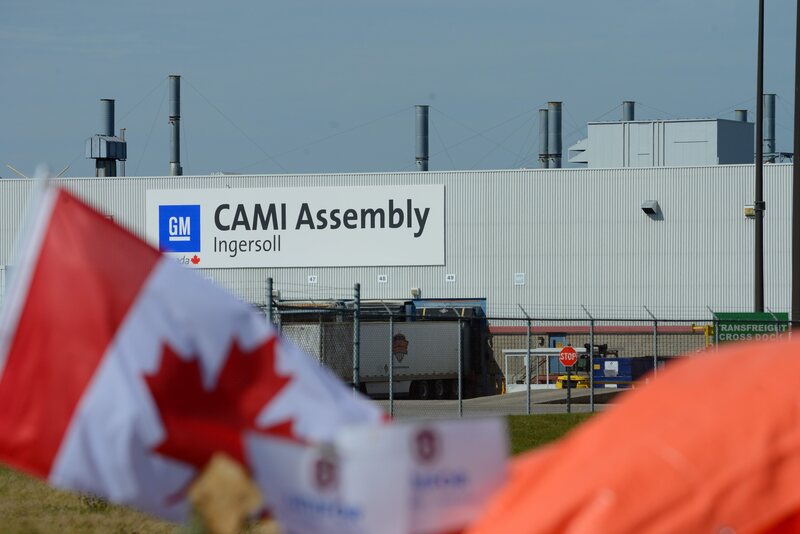 A Canadian flag flies while workers represented by Unifor are on the picket lines of the General Motors CAMI Assembly plant in Ingersoll, Ont. on Saturday, Oct. 7, 2017. The Ingersoll example is one of many. And not all are connected back to the NAFTA, but free trade agreements more broadly — and there are many. Oftentimes, even the threat of workplace or plant relocations can dampen workers' demands for higher wages, better pensions and workplace security. If nothing else, free trade deals help sharpen the sword that hangs over workers' heads. This is why I can't stomach the arguments of those who say NAFTA and deals like it have brought nothing but good news to Canada. That's a lie. But what's also clear is that the consequences of weak trade rules affect us beyond factory gates. In Canada, there is a persistent gender pay gap — a result of a deeply-seated labour market sexism and over-representation of women in low-wage, precarious jobs. Indigenous people face unemployment levels disproportionately higher than the rest of the country. Racialized workers and workers from vulnerable communities face added barriers to skills training, good jobs and upward mobility. Not only do current NAFTA rules not contemplate these negative economic and social outcomes, they're simply dismissed as out of bounds and entirely unrelated to trade. But here's the thing. If trade deals facilitate the lowering of Canadian wages; if they enable companies to undermine collective bargaining; if they facilitate the outsourcing of work and the offshoring of investment from our communities; if they bind the hands of government to set local development and job creation policies... then, yes, trade deals have a lot to do with these bigger social challenges. And in my view, that means new trade rules should help address these challenges too. Not only do current NAFTA rules not contemplate these negative economic and social outcomes, they're simply dismissed as out of bounds and entirely unrelated to trade. Canada's negotiating team has boldly tabled a set of progressive proposals at the NAFTA table which deal with some of these issues, including the enhancement of labour rights. These provisions would help to ensure trade benefits workers, in all three countries, and lessen the tendency toward a race to the bottom on wages and working conditions. On environmental rules, Canada's looking to push the U.S. further than they are comfortable going, on matters of climate change. All of that is good. But at the same time, Canada's ambitious labour proposals in NAFTA don't appear to jive with what's been negotiated in other trade deals, like the TPP. The proposed gender chapter, if at all based on the existing Canada-Chile agreement, lacks substance. And it's not at all clear how Canada hopes to advance Indigenous rights in NAFTA or other trade deals. There's no doubt in my mind that provisions such as these, among others, can form the basis of a real progressive trade agenda or a new negotiating mandate for Canada — but they must be defined by concrete proposals, rather than lofty platitudes, and sooner than later. I've long felt that NAFTA renegotiation was a good thing for Canada. It's a generational opportunity to start righting the ship on global trade policy, and to embed the broad principles of equity, social justice and human rights, as cornerstone elements of a new approach to trade. But now's the time to put meat on that bone. Let's give this Progressive Trade Agenda some substance. Let's ensure all of Canada's civil society has a say. With core principles matched by concrete proposals, we can help to ensure the rules of trade better acknowledge the effect — both positive and negative — trade has on all people.